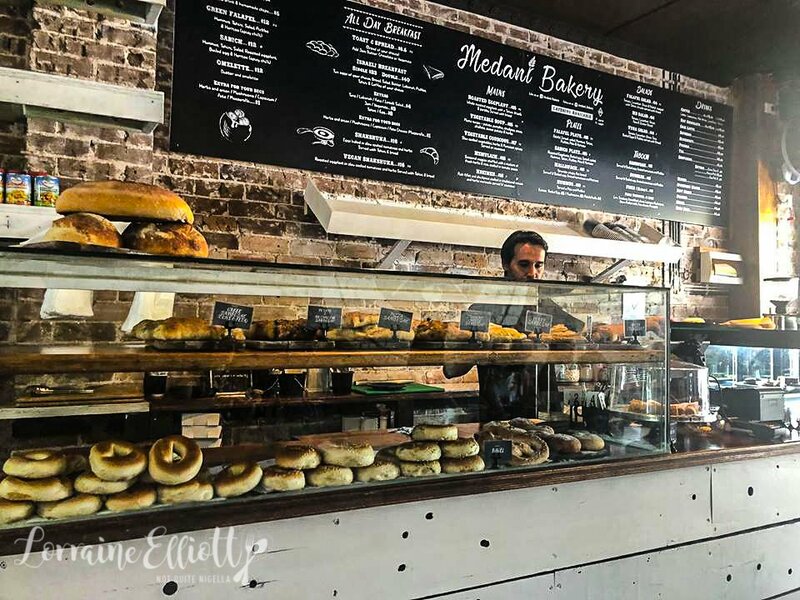 This unassuming little Jewish or Israeli bakery cafe in North Bondi and Bondi Junction churns out delicious food. 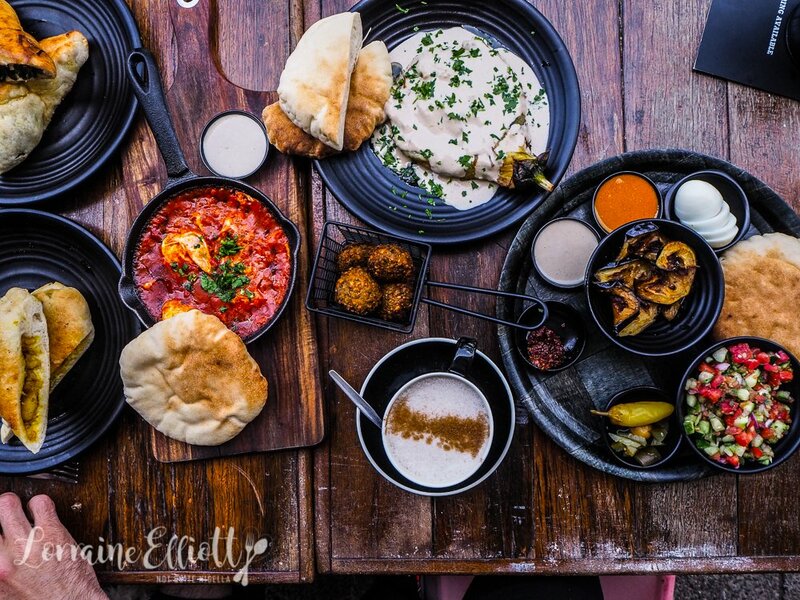 There are fluffy pita breads, soft and pillowy sambouseks, crisp bright green felafels, shakshuka and plates of Israeli style food. And most of it is vegetarian too! It's hard to lure Nina to eat out. She told me once that she considers restaurant prices to be generally outrageous in Sydney so she usually just drinks wine and skips the food. Suffice it to say that it has to be something either cheap and cheerful or delicious to get her interested. 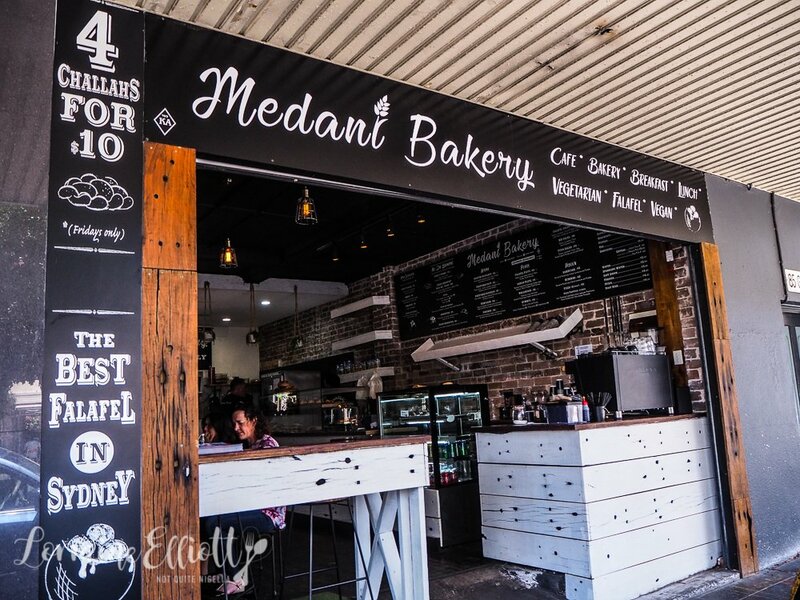 That was Medani Bakery, a Jewish Israeli cafe and bakery. 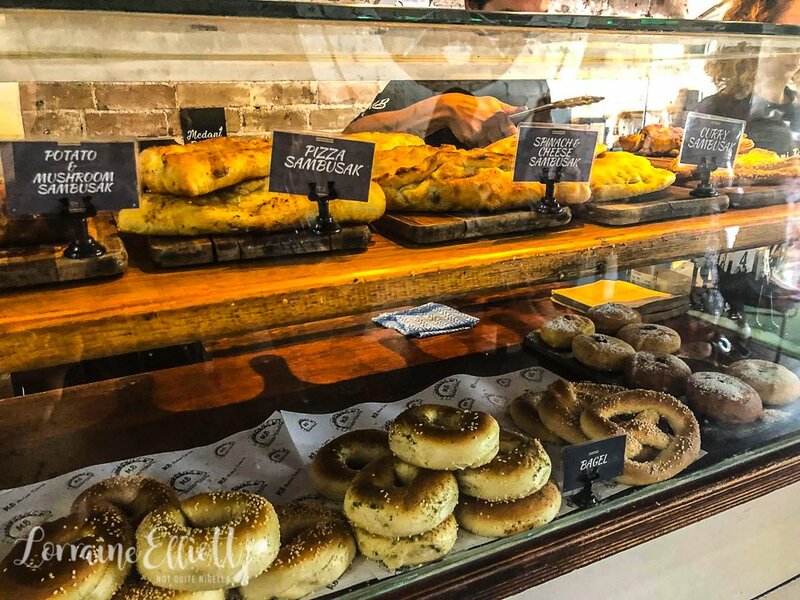 She has fond memories of past visits to Israel and being served fresh, delicious food on plates with lots of different ingredients. A date was made to try out Medani one Sunday. Medani is a combination of the letters of the owners last names. 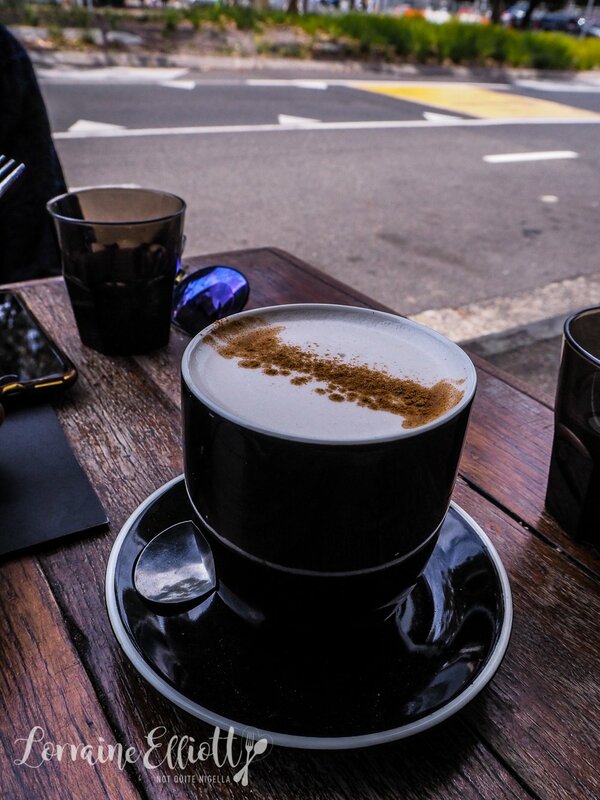 There are two tables outside the North Bondi store (the newer one) and we take a seat at one with little Mochi. You can either order inside or at the table but inside is faster perhaps. We look at the menu-I usually order for Mr NQN, Garth and I while Nina chooses something for herself. But then we realise that pretty much everything but two items (fish dishes) are vegetarian so we decide to share everything. Service is quirky-it's super low key and although not overly enthusiastic it's polite and they answer our many questions about what is good to order. We order drinks to go with our food and the bill is a very reasonable $40 per couple. Everyone else has coffee while I have a chai latte and they ask if I'd like powder of leaves. I go with leaves and it takes a while to steep but it is worth it with all the lovely aromatic spices. 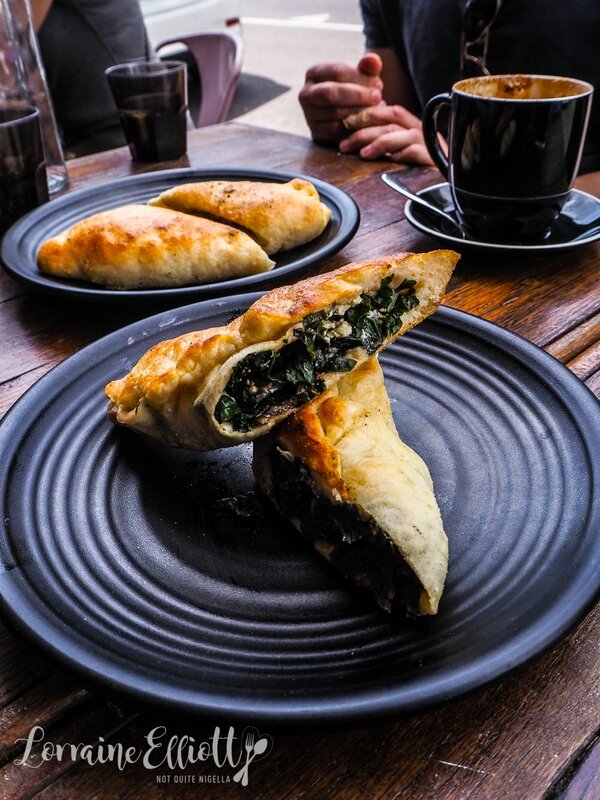 The first things we try are the sambousek. We were lucky with our timing as it meant that we just caught a new delivery of sambouseks and pastries. There are several different fillings and we try a spinach and cheese one and a curry vegetable one. Cutting into them they are light and puffy. The spinach and cheese one whilst tasty is mostly spinach and we'd love a bit more cheese. 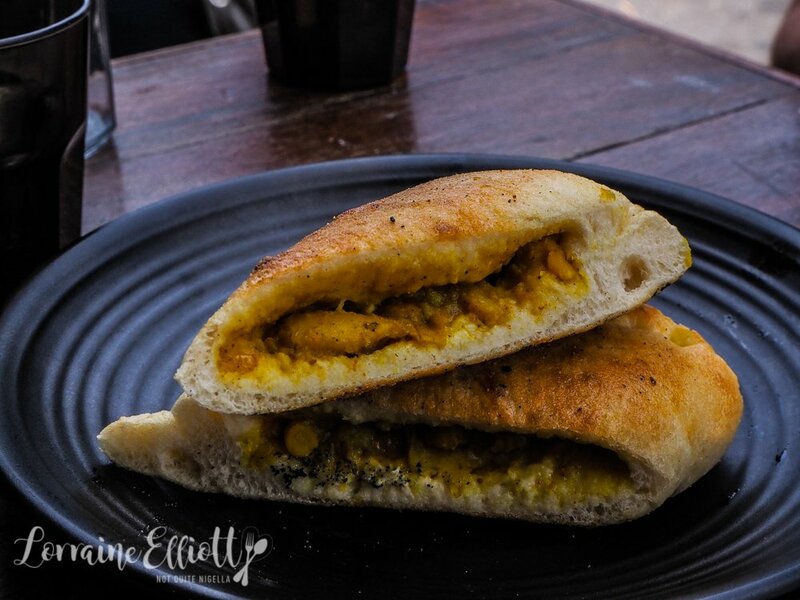 But we are all seriously in love with the curry vegetable one with a potato based spiced filling. I could have happily eaten a whole one to myself as could Nina which is really saying something. Then we try the shakshuka. 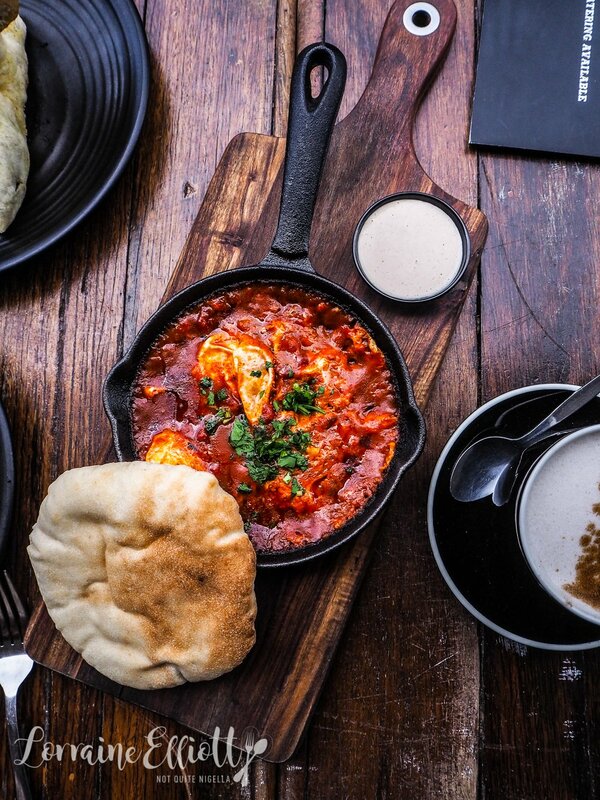 We all love shakshuka, especially Nina who always orders it if she sees it on a menu. This one is fantastic, full of flavour the tomatoes are perfectly rich and full bodied. It has two baked eggs in it and a side of tahini and bread. The roasted eggplant is a whole baked eggplant that has a lovely creamy texture served with a side of that wonderful puffy pita and parsley. It is actually quite nice when you get a bit of shakshuka and this together on a pita bread. The only plate that we didn't really go for was the Sabich plate. 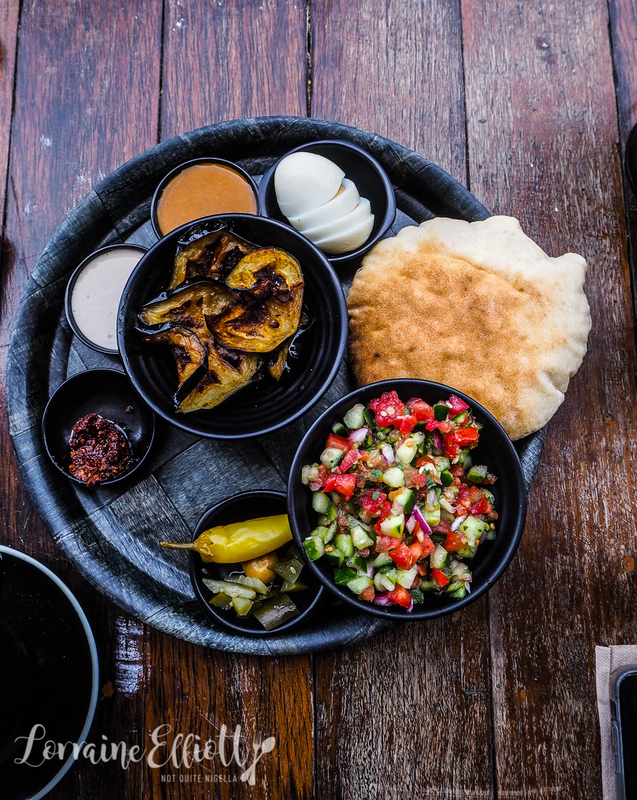 There's a chilli harissa paste, an Israeli tomato salad, grilled eggplant, a boiled egg, tahini, a hot sauce and pickles as well as a fresh, fluffy pita. I think perhaps having a couple of dips to tie this together would have helped as well as some more seasoning of the salad (I later checked and there was supposed to be hummus and tahini but it looks like just tahini was served). The extra felafel that come out in a little basket are fantastic-crunchy on the outside, bright green and moist and full of flavour on the inside. While we were eating they seemed to bring out bowls of complimentary fried pita bread strips. 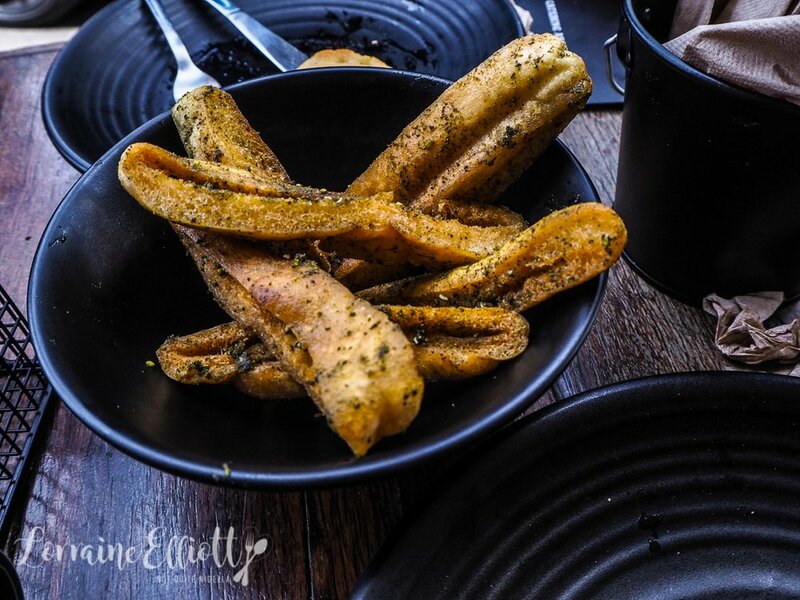 These are deep fried until crispy crunchy and rolled in za'atar. Even deep fried phobic Nina (it messes with her stomach) declares these fantastic. We didn't intend to try the pastries or desserts, mainly because Nina and Garth are on a diet but well you know me and pastries right? I go in and buy a couple of other things: the hazelnut croissant and a Jewish donut called Hanukkah Sufganiyot that is only available around this time of the year. 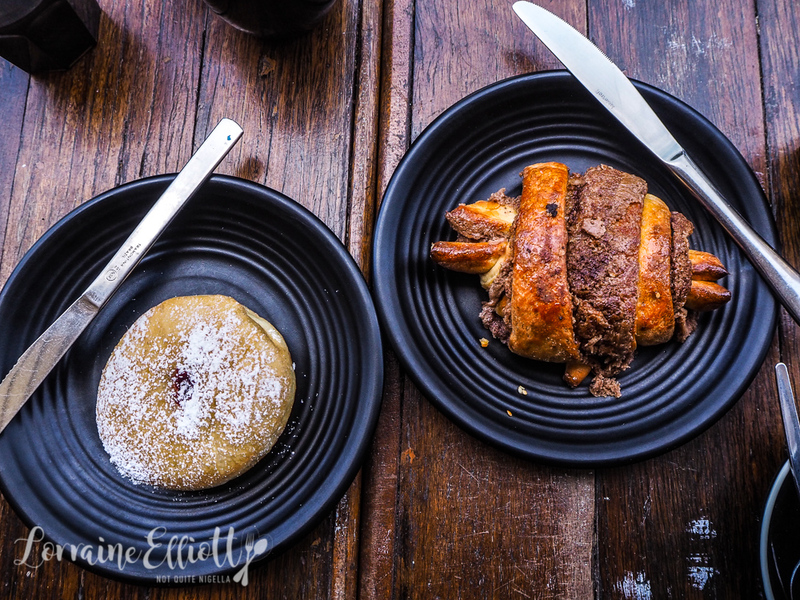 The donut is puffy and light, lightly covered in sugar with a little dab of jam in the centre. And the hazelnut croissant isn't so much a croissant, it's a sweet hazelnut roll in a croissant shape. When I cut into it there aren't any buttery laminated layers. Instead, it looks like a cinnamon bun except hazelnut flavoured. It's super rich, sweet and decadent and hard to resist, even if you're on a diet like Nina and Garth! So tell me Dear Reader, do you agree with Nina that dining out is expensive? Do you ever just skip the food and just drink wine? 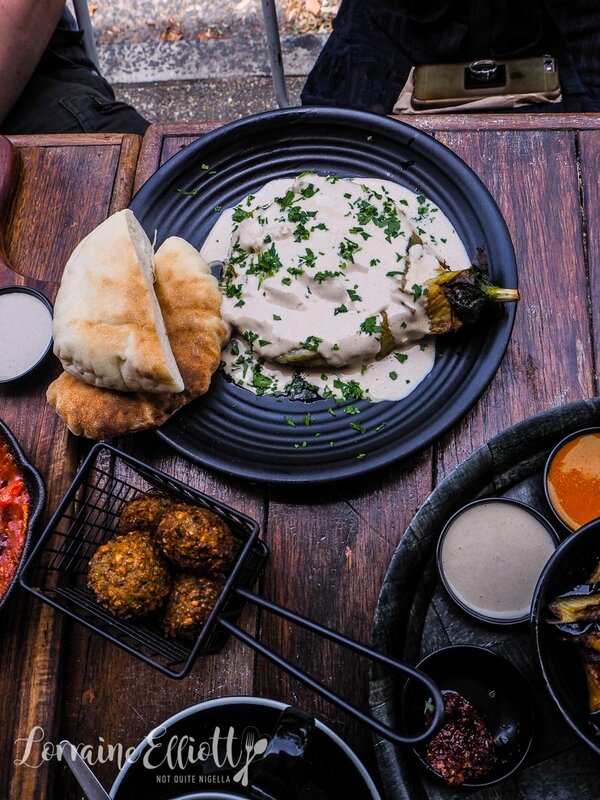 And do you like Israeli food?